In a landmark move, the Syrian Army captured the large town of Hamuriyah, where an estimated 4,000 civilians remained hiding from air and artillery bombardment in concrete shelters and basements. At least 7,000 civilians fled through a humanitarian corridor there as well. A Syrian Arab Red Crescent convoy of 25 trucks carrying food entered Douma. The government has also taken Rayhan town, ending a weeks-long Army of Islam defensive campaign and removing the rebel-held salient. 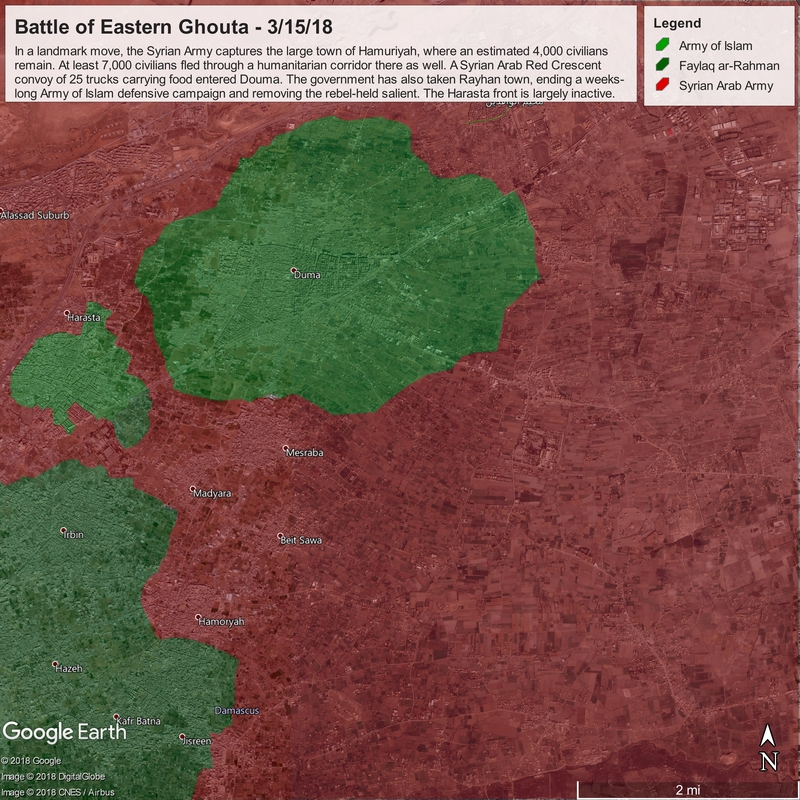 The Harasta front is largely inactive. These advances are largely made possible by the intense, endless Syrian Air Force bombardment on the southern pocket, which has no doubt hit and destroyed many rebel military targets there. The rebels seem to be unable to mount a useful defense of the area, and at the current rate of retreat, the entire southern pocket could be captured within two weeks.